8-round Sig Sauer 1911 .45 ACP Magazine. High-quality replacement! Make reloading quicker when you're ripping up the range with this 7-round Magazine. Constructed from durable stainless steel and designed to fit all Sig Sauer 1911 handguns chambered in .45 ACP. Get yours here for LESS! 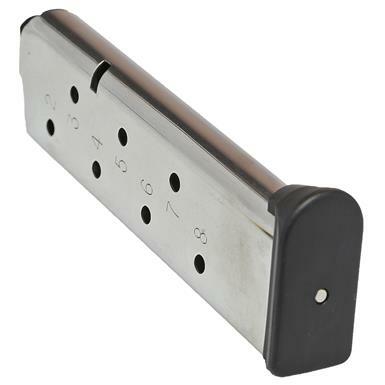 Sig Sauer 1911 .45 ACP Magazine, 8 round is rated 5.0 out of 5 by 2. Perfect mag with a hardened nickel finish! A strong and reliable mag!